The 3.7 L (3670 cc/223 in³) engine of the DB4 was designed by Tadek Marek and features in different guises throughout the DB range. Aston Workshop are responsible for more restorations and engine rebuilds of the DB range than any other company and we have used our considerable expertise to develop the upgrades available here. The brief leading to the design of the DB4 engine was finally agreed in 1956, having initially started as a requirement for a 3 litre engine, it was gradually enlarged over the years to 3.7 litre capacity. Today, it can be made to run reliably at up to 4.7 litre capacity, with a longer stroke crankshaft and increased bore size. An increase in engine capacity to a maximum of 4.5 litre, that is the limit on the safe cylinder bore size that can be reliably tolerated. It is more normal to increase to 4.2 litre, that has become the default specification for any overhauled DB4, DB5 and DB6 engine. While the 4.2 litre engine leads only to a very minor increase in power, there is some useful mid range improvement in torque, but to achieve any significant increase in performance, other changes to camshafts etc will be required. Carburation – The original standard engine configuration involved a variety of different carburation arrangements, ranging from twin SU HD8s on the DB4, triple SU HD8s on the DB4 Vantage specification, and with the DB4 GT, triple twin choke Weber DCO-E9s. Later, with the introduction of the 4 litre DB5, the triple SU HD8s became the default with the Vantage tune standardising with triple twin choke Weber DCO-E9s. Aston Workshop High Lift – best suited to use with the DB5 and DB6 Vantage with triple Webers, in which they provide a very noticeable and consistent increase in engine torque of the region of 25% or so over the standard spec. The car will feel noticeably livelier and from 2 to 2500 rpm, it will pull particularly strongly all the way to the red line. The downside is a slightly lumpy tickover and some loss of flexibility below 2000 rpm. Lightweight Forged Steel Crankshaft – While this component is not an essential addition to the fast road engine specification, if the engine is being given a complete overhaul, the additional cost arising from the fitment of this new crank compared to the cost of regrinding and polishing the original is marginal and with the added assurance of standard sized journals as opposed to reground undersize journals. 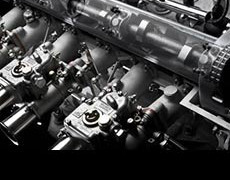 Lightweight forged Cosworth pistons and new cylinder liners – a rebuild of an engine involving conversion from the 3.7 or 4 litre to 4.2 or 4.7 litres will involve fitting new liners and pistons. Compression ratio – This is set for the requirments of the engine. Ignition – As part of the default specification will be the fitment of a full solid state electronic ignition using the 123 Distributor. This will not only control the advance curve for the ignition more accurately, but will also provide a higher intensity spark with commensurately cleaner exhaust emmisions. Aspects of engine development also include gas flowing and blue printing of the cylinder head and block assemblies. Each project really needs to be discussed in detail before a final specification can be finalised. A further development is to fit the GT Cylinder head. This differs from the standard by having twin spark plugs for each cylinder. Originally this cylinder head was developed for the DB4 GT. 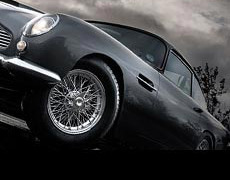 Around 120 DB4 GTs were manufactured during 1960 and 1961. The GT engine provides a further small but significant increase in power, particularly at 4,500 rpm and above. This GT cylinder head can be offered on any of the fast road or ultimate engine specifications. Some significant modifications are required to the engine bulkhead and heater assembly, to provide adequate clearance for the second distributor. The cylinder head comes with some significant improvement in inlet and exhaust porting over the standard head, which further aids the breathing. A fast road engine will be quite capable of pulling a higher final drive ratio. The recommended change will be from 3.73 to 3.54 to 1 giving an extra 2 mph per 1000 rpm in fifth gear. For engines fitted with auto transmission, the standard final drive ratio is 3.54 to 1 and the recommended change there will be to 3.31. This would also be the recommended change for manual DB4 cars fitted as standard with a 3.54 to 1 final drive. An additional option is the fitment of a 6 speed manual. Currently not a standard transmission option, it could be offered if desired and would potentially enable a further reduction in the final drive ratio for manual cars from 3.54 to 3.31, with 6th gear giving a road speed in the region of 35mph per 1000 rpm. Such an option could realise a very useful improvements in fuel economy. DB4 – Fit the standard duplex Girling Brake system upgraded as below. Wheels : Default to move to 6.J rim size wheel and to fit 205/70 section radial tyres with an added option to fit 225/70 radial tyres on 15 wheels.